It can get very hot in Bobo-Dioulasso, so pack lots of water to keep your family hydrated. It's also a good idea to have either your hotel or driver call ahead to the Mosque to book a tour guide. This way you won't have to worry about choosing the right one. Temperatures in the fall can be warm but still bearable. February through April can get to upwards of 50 degrees Celsius (122 degrees Fahrenheit), so be prepared for the heat. December and January have cooler temperatures with minimal rainfall. This day trip is for families seeking a truly off-the-beaten-path Africa adventure with their children. Get a real feel for what life is like in Burkina Faso, and experience local life in Bobo Dioulasso firsthand. Start your day with a visit to the Grand Mosque and learn about the fascinating Sahel-style mud architecture common in Western Africa. Afterwards, go on a guided tour through the historic Kibidwe neighborhood, an eye-opening experience that provides many teaching moments to talk about later with your kids. End your day at the bustling local market and explore its many offerings. It can be a hot and tiring excursion, but it will be highly rewarding in so many ways. Plus, how many opportunities are there to eat a caterpillar! The Grand Mosque is a beautiful example of the mud architecture common in West Africa. It was built in the late 1800s and has withstood some rather harsh natural elements. 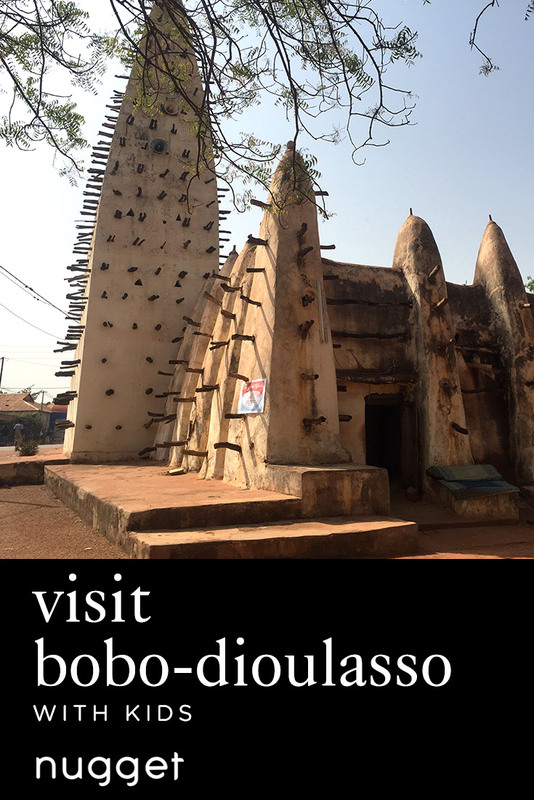 A visit provides the opportunity to learn about the importance of Islam in the building of current day Bobo-Dioulasso. If you're lucky, your tour guide will be a direct descendent of the original Imam. Our favorite part of the tour was climbing the very narrow staircases up to the rooftop to look out over the city. The girls loved the "skylights" on the roof and learning about their use as a light source before the city had electricity. DIRECTIONS The Grand Mosque is in the center of town. Every taxi driver will know where it is, or you can walk if you are staying close by. It is just east of the Grand Marché, where all the taxis hang out. TIP You need to remove your shoes to enter the Mosque; however, as a female, you're not required to cover your head. Kibidwe is the original neighborhood in Bobo-Dioulasso. It's divided into four quarters, each for a specific group of people: Muslim, Musician, Farmer/Textile and Blacksmith. Each neighborhood has it's own distinct feel, but everyone interacts and lives together peacefully. Local life still proceeds just as it has for decades, and a tour of the neighborhood provides a glimpse into what life is really like in Burkina Faso. During the tour, there will be obligatory stops at certain tourists shops along the way, typically one per neighborhood quarter. We used this as a learning experience and didn't feel pressured to buy anything. There was also the opportunity to try some local millet beer and visit a large shrine, common in the traditional West African VooDoo religion. The last stop is at the Houet (We) River, with the opportunity to feed the sacred catfish. This was an eye-opener for us. The river was so polluted that I wasn't sure how anything could survive in there. There were a number of people washing their clothes along the side of the river. The spring that feeds the village was right beside the polluted river. It made us very grateful for our running water. DIRECTIONS The entrance into the Kibidwe neighborhood is directly across the street from the Grand Mosque. You're supposed to have a guide for the neighborhood - wandering alone is frowned upon. It's easy to either have the guide from the Mosque or your taxi driver arrange a guide. This will eliminate the necessary negotiations, which, in my opinion, makes it a more pleasant experience. TIP The tour lasts a couple hours, with no opportunity to stop for a drink or to go to the bathroom. Make sure to pack some water and take a bathroom break after touring the mosque. Grand Marché is a massive market, selling everything from clothes and fabric to plastic toys and food. It's a local market not an artisan market, but it can be a good place to find souvenirs. It's interesting to wander around, seeing the diversity of items available and the difference between what they have and what we have at home. One of our favorite things to see (but not to eat) was the shea tree caterpillars. There were large containers full of these caterpillars everywhere, since they are a favorite snack of the locals. Most of the stalls are inside, however there are also a large number of stalls lining the streets surrounding the market. I found the exterior stalls to be more comfortable to walk around as there was more space to move. There is some vehicle traffic outside though, so make sure to keep your kids from running into the street. Keep an eye out for tea stands on the corners. For a few cents, you can sit on a little bench and have a cup of Lipton tea. DIRECTIONS You should end your Kibidwe tour back at the Grand Mosque. From Kibidwe, the Grand Marché (the local market) is on the opposite side of the Mosque, approximately 500m (0.3 miles) walking. Walk south of the Mosque to the traffic circle, then head west on Coulibaly (you'll take a right at the traffic circle). This road runs right into the market. TIP Be aware of the "middle man." If you're approached outside of a stall by someone asking if you're interested in an item, don't negotiate with him. You'll end up paying an inflated price because he'll take a cut of the profit. WE LOVEDFranca, our host, was very welcoming and made us feel at home during our entire stay. The gardens were beautiful, and the kids were able to run around outside without any worries. There were also other children around, and they held a large family BBQ on Sunday afternoon with many expatriates and their children. WE DIDN'T LIKEThere is a pool next door at the owner's house, but it wasn't functioning while we were visiting. It would have been a wonderful addition! TIPThe family rooms, with a queen-size bed and two single beds, worked wonderfully for a small family like ours.